The Basil Maiden cocktail sets the booze on slightly, and the Beer Can Chicken is a classic dish that’s a dream for two. A castle separates the rich from the poor with towers, walls and guards. A speakeasy separates the hip from the square, with secrecy, passwords and hidden entries. Bodega, and its underground, vault-like restaurant/bar, The Rest, are separate, but they let all the customers be hip. Upstairs at Bodega, there are affordable shots, priced-just-right beer, handheld food and a jovial atmosphere—very different from its secret downstairs cousin. If you haven’t made a reservation, you must ask to be admitted to The Rest (dress up before you come here, as it’s a nice joint and you should look the part). I’ve come here before without a reservation, but only on off nights and earlier in the evening. The two rooms are cozy, and they fill up as the hours progress. If admitted, proceed through a plain door and down a wind of office-style stairs to another nondescript door behind which the light changes and the air grows more worthwhile. I enter this dark space and feel … lighted—it is “The Bar.” It’s the bar I want to find in the basement when I walk down those last stairs of this life, impossibly tall yet claustrophobic enough to make drinking and lovely friends into dreamlike memories. The bar room and tables are darkly lit, and in the back is a grotto-inspired library with conspiracy-sized seating arrangements. The whole space is musically propelled by an honest-to-god turntable and a respectable collection of vinyl. Looking out over the various tables are the seven deadly sins hidden behind crystal eyes that peer cyclopean from bird houses that might have once housed inky finches. Ancient photographs, oil portraits and numerous taxidermies haunt the upturned eye—a room inspired by the Brothers Quay. It’s a place that loves itself maybe a little more than it should, but that makes it all the more attractive. Like some self-amused genius at a party, one won’t have to add to the conversation to enjoy the monologue. The drinks here are fine examples of the speakeasy cocktail—simply made with quality booze and classic bitters. Caleb Cannon and staff are constantly creating new recipes and variations on classic drinks, so the cocktail menu varies. I had a Basil Maiden with a house-made rhubarb shrub that set the booze ever-so-lightly on. Sweetish, but good with food, the Little Horse was an easy ride ($9 each). The After Dark ($10), a kind of Walter Matthau/Billy Bob Thornton breakfast drink, made with coffee, egg and bourbon, and The Fathom ($11), a pirate-inspired zombie (lots of rum and coconut and some more rum), were both great variations on more common drinks. If you need a belt and feel a twinge of noir, the Prescription Julep is a whisky and cognac cure-all. This is a Dorothy Parker drink—witty, almost sweet, but also kind of mean. There are beers, too—in a fine selection of bottles. In a bar where the drinks are so well-conceived and delightful, the addition of a food menu might seem like an afterthought. But then I order, and the menu reads like a Christmas tree loaded with presents. Unlike presents, though, the food here is, by and large, better than I hoped, and more surprising. Like the cocktails, the food menu changes with the seasons. I had the Garden Toast and Pickled Onion Rings ($7 each) on different occasions, and both are great appetite whetters. The Scotch Egg ($8, a hard-boiled egg enclosed in sausage, rolled in breadcrumbs, and fried) is really a breakfast dish, as is the Pork Belly ($10)—Both are a.m., but in a p.m. kind of way. The Pork Belly has a particular drunken sweetness that, mixed with the oily pleasure of the meat, makes my mouth feel primal and holy. The Scotch Egg is a city cousin of lumberjack food. Dominating its beautiful presentation like a plush meat fruit, it appears a fist-sized, egg-shaped challenge, but it eats just fine. If Easter were a sausage holiday and not about chocolate, we would hide these for hungry children in the forks of yard trees every spring. If it is on the autumn menu, get the Paella—I have a private rule: Always, when there is paella available, get the paella. It is good here—not dominated by saffron like my childhood paella, but subtle—both rich and light, which is the trick to this dish. It’s served Vegetable ($28) for vegetarians, Valencia ($32) with pork, chicken and chorizo, or Seafood ($37) with scallops, shellfish and shrimp … and chorizo. It serves two quite nicely. 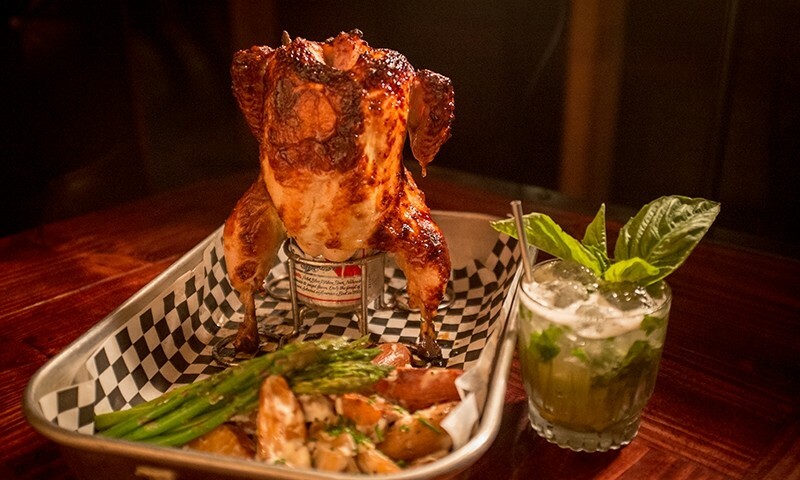 For goodness’ sake, if you like meat, get the Beer Can Chicken ($35). It is one of the best simple pleasures served in this town, offering a hearty serving of sublime feeling. Served with a surprisingly great, warm fingerling potato salad, asparagus and wild mushrooms, it is, for the carnivorous, a magnificent way to break bread. One could eat the whole thing, but it’s meant for two. 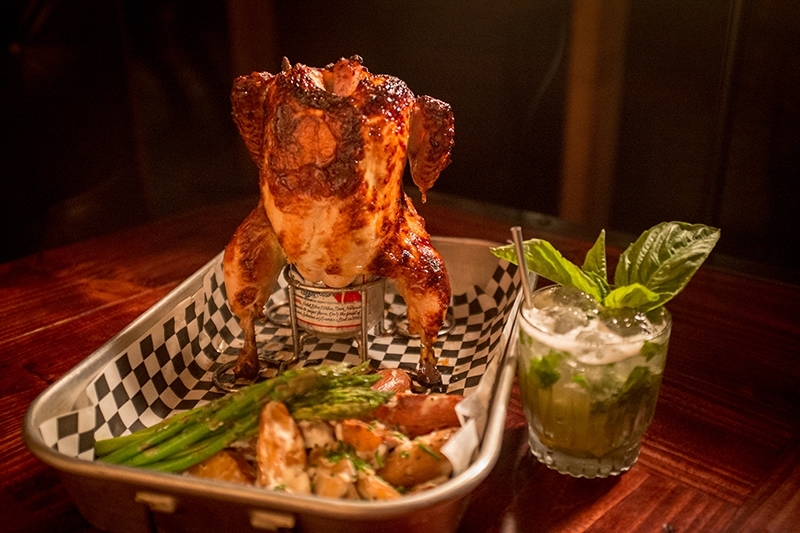 And presented first, whole, its wings outstretched, sassily perched on its beer can and then re-presented carved and boned for dining, it is a show in itself and a no-brainer for the active foodie. The Rest is my “why Salt Lake is great” restaurant/bar of choice right now, which might be a problem, as it is so small and so special. I almost hate to share it with anyone new—not for fear that it will go away, but that there won’t be any room left for me.